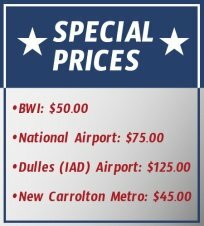 Do you need a ride from or to the National Airport? Our taxi company offers comfortable cab rides to Ronald Reagan National Airport with room for all your baggage and at the lowest rates you’ll find! Our drivers are always on time, and along with our satisfaction-oriented focus, we guarantee we’re your best choice! We offer a Special Flat Rate of $75 for your convenience, book your ride now! One of the biggest benefits of Annapolis Taxi Service is that we work 24/7. Emergencies do happen, and if you need to reach the Reagan Airport immediately, one of our cabs will always be ready to help you. Taking your own car to the airport will result in unnecessary parking fees and risk of theft. Also, you may not always want to bother a friend or relative asking for a ride. No matter what the reason is, our taxi services will always be a cost-efficient way of traveling from or to the Reagan National Airport. Annapolis Taxi Service offers free booking for any taxi ride. Whenever you have plans of traveling and/or commuting to the Washington National Airport (DCA), you can book your ride either online or by calling us at (443) 995-1400.